Instant Pot Pork Chops and Baked Beans is a comfort one pot meal that is ready in less than 30 minutes. Homemade baked beans or canned beans can be used. My husband’s mother had five children and had to come up with meals that everyone would eat. My husband tells me that his Mom really knew how to stretch a dollar and come up with tasty, but easy to prepare meals. 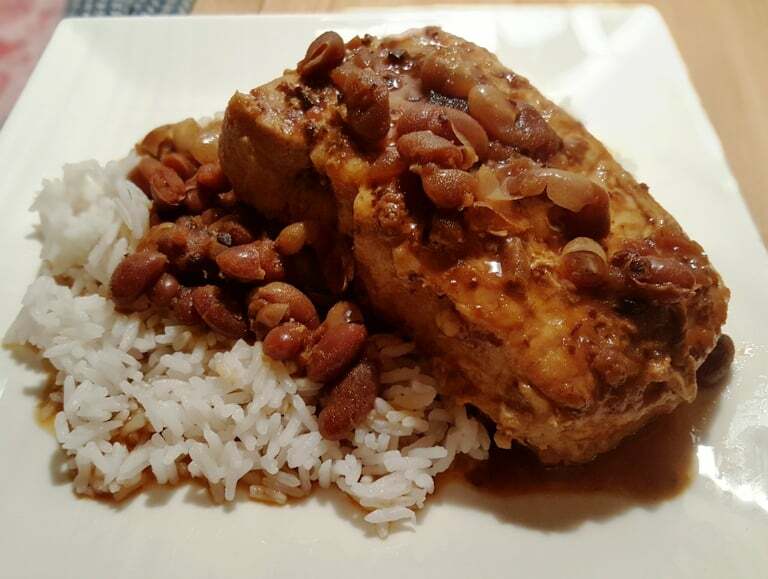 Pork Chops & Beans over Rice is one of my husband’s favorite dishes his mom used to make for the family. To me, this recipe is very plain and simple and surprisingly good. Whenever he gets ready to cook this meal for dinner, a nostalgic, comfort type of look comes over his face and he seems to be transported back in time. 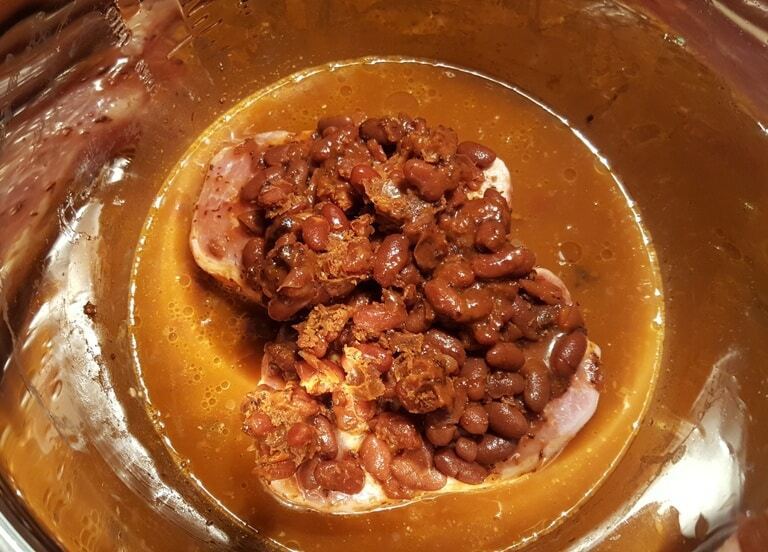 This Pressure Cooker Pork Chops and Baked Beans was made because the Hubs was all set to make his Pork Chops and Beans last night. I decided to convert the recipe for the Pressure Cooker, since we love the Pork Chops in Homemade Mushroom Gravy made in the Pressure Cooker so much. I also used a tub of my homemade Holiday Baked Beans that I had in the freezer. Suffice it to say, this was NOT his Mommy’s dish, so next time, he will make it on the stove, exactly how she prepared it and I will post the recipe. You know, one should never mess with something loved by a son. 😉 The meal came out pretty much the same in the Pressure Cooker as on the stove, but hubs will never admit it. Men, huh? I used thick cut chops, but I would suggest using 1/2 inch to 3/4 inch bone in chops, as I think bone in gives more flavor and the chops under one inch seem to do better in the Pressure Cooker. 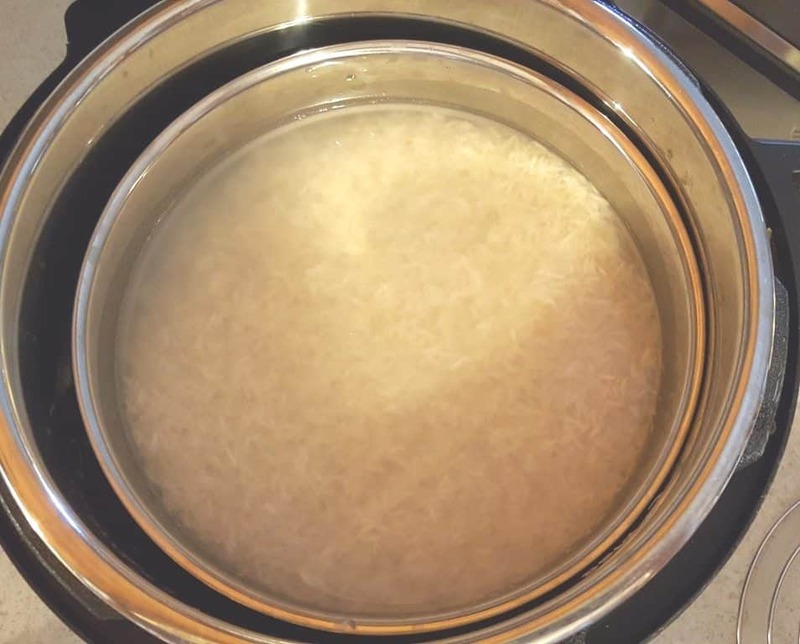 If you would like to cook your rice at the same time and in the same pot with your Pressure Cooker Pork Chops and Baked Beans , please check out my Pressure Cooker Perfectly Cooked Pot In Pot Rice recipe for step by step instructions. 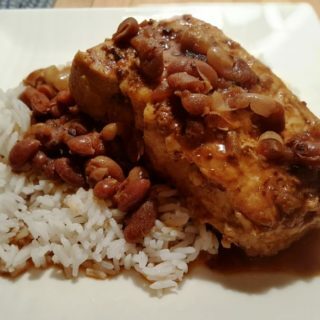 Turn this Pressure Cooker Pork Chops and Baked Beans recipe into a one pot meal! This super, duper simple. Pour in the water and then drop in the pork chops. Dump in the beans. Hubs uses a couple of cans of Campbell’s Pork & Beans but I used my homemade Pressure Cooker Holiday Baked Beans which I had pulled out of the freezer. You can see that they aren’t even fully defrosted. You certainly can use canned baked beans rather than homemade. Apparently, this must be served with plain white rice. We love the Rico Rice the best. 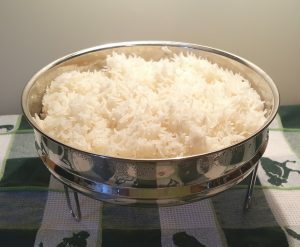 If you are not doing Pressure Cooker Perfectly Cooked Pot In Pot Rice, here’s the recipe for Pressure Cooker White Rice. See, super simple. Hubs wasn’t buying it though and said his way is better. Interestingly enough, he cleaned his plate. Ah uh…..
More Instant Pot Pork Recipes You Will Love. 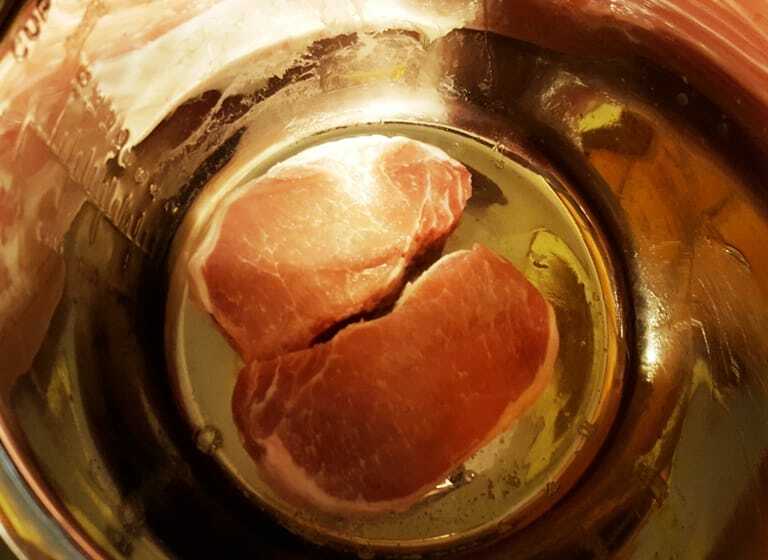 Place water in Pressure Cooker cooking pot and place pork chops on top. Pour the beans over pork chops. Place trivet in pressure cooker and place rice pan on top of trivet. Add water and rice. Lock on lid and close pressure valve. Cook at high pressure for 4 minutes. When beep sounds, wait 10 minutes and then release pressure valve. Remove pan of rice and simmer a few minutes to reduce liquid, if needed. Plate pork chops and rice and serve beans over rice. If your beans are very dry, add the 1/2 cup of water, otherwise, just use 1/4 cup of water. This is a very bland recipe. Bone in chops are the preferred chops. PIN this Pressure Cooker Pork Chops and Baked Beans! Thanks for that catch. I meant to post the water and then hit publish before doing so. I used about 1/4 cup of water. The beans have a good amount of liquid and the original recipe on the stove calls for simmering for a bit in just the water, until it evaporates. If your beans are super dry, then you would add 1/2 cup of water. Thank you so much. I’m going to try this this weekend. If you were cooking just pork chops how would you have seasoned them? We usually do not use sauces. Thanks! 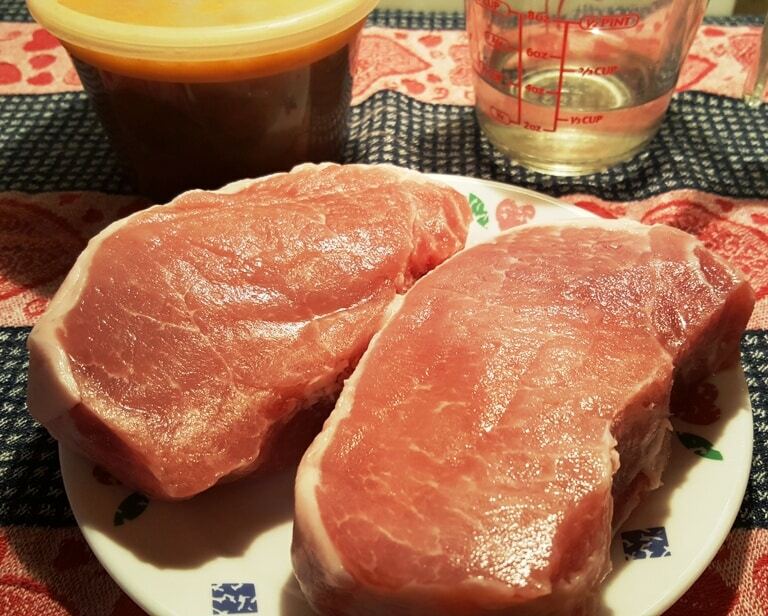 How would I cook pork chops with just seasonings? 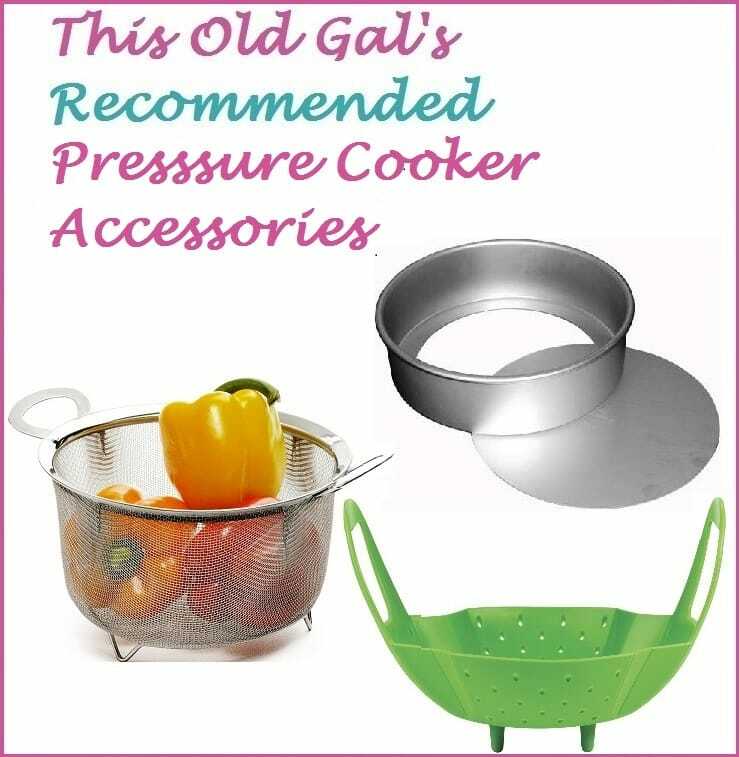 I am a new owner of Power Pressure Cooker and have not cooked anything as yet. Thank you very much. Great recipe!!!! The pork chops were nice and tender! Your website is the first one I come to when I am looking for a recipe! Regarding your comment that it’s a bland recipe. How would you season it up to make it not bland? Thanks.